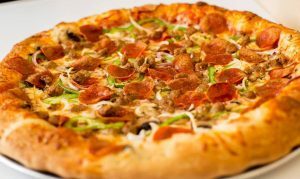 Vincenzo’s Pizza has been here for almost 25 years, and time and time again is voted "best pizza in the Santa Clarita Valley." In addition to the best pizza, we work very hard to provide the best customer service possible. For over 25 years, Vincenzo’s Pizza in Saugus has served the best pizza in the Santa Clarita Valley. We pride ourselves on our delicious menu, our outstanding service, speedy pizza delivery, and our involvement within our community. Family owned and operated, we continue to make our Italian pizza exactly the way we always have—with the freshest and highest quality ingredients. In other words, you won’t find fake cheese or canned sauce here. Our famous crust is hand tossed, our cheese is 100% whole milk mozzarella, and our vegetables are sliced fresh every single day. Make sure to try our other exceptional menu items as well. We offer fresh salads, pasta dishes, deli-style sandwiches, wings, garlic bread, and of course beer and wine. Make Vincenzo’s your new, local hangout spot. We offer a weekly pizza special, so that you can try a new pizza combination every week at a discounted price! 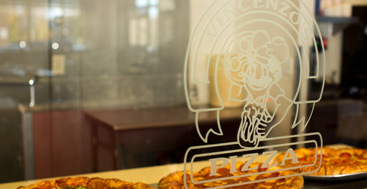 At Vincenzo’s you can always count on great food and a casual, upbeat atmosphere. Choose us for your team party or special family event and enjoy our semi-private dining area. 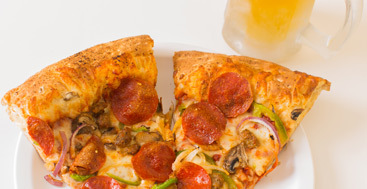 Come in to watch sports and have some authentic Italian pizza, cheesy bread, and a few cold beers; or let us bring your fresh and hot pizza and wings to your doorstep. We offer a wide-range pizza delivery service. During fall and winter, come in to check out the Saugus High Jazz band while enjoying our local pizza, or stop in for a night out with the family. Try our family meal deal for an affordable and delicious pizzeria experience! Our entire menu is available for delivery all day, unless you’d like a cold beer in a chilled mug—you’ll have to visit us in person for that. While you are here, watch your favorite team on our high definition, flat screen TV’s and nibble on our roasted peanuts in the shell at your table. We’ll even let you throw the shells on the floor. If you want a little more than just great pizza served by our friendly staff, how about our famous garlic cheese bread, a batch of delicious wings, or a crisp salad made to order? Join our mailing list (we won't share your email!). You'll receive coupons and news each month via email. Our full menu (excluding alcohol) is available for carry out and delivery. 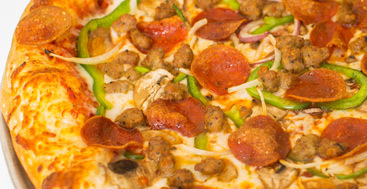 Our small pizza compares to what many pizza joints call a large, so you won't ever leave hungry. Comments? Questions? Just want to send us some love? We take comments seriously and would love to hear from you!